“Harry Potter and the Deathly Hallows: Part 1” had an amazing opening $61.2 million domestically in its first day. 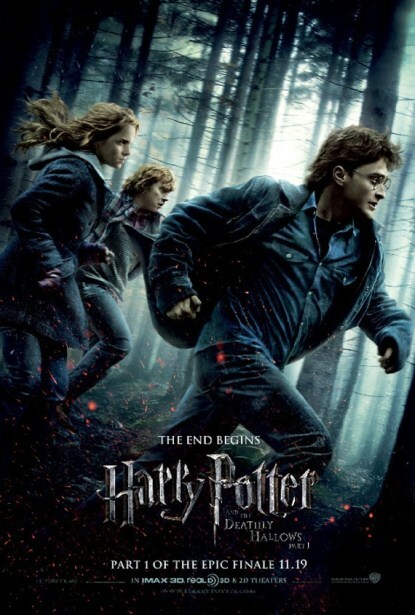 The Harry Potter series previous record was for “Harry Potter and the Goblet of Fire” in 2005 and it looks it may beat the $102.7 million opening weekend of the 2005 one. Rumor has it the movie has lived up to the hype and is by far the best movie of the series to date. “Deathly Hallows” comes in at No. 5 on the box-office charts for biggest opening day, behind “The Twilight Saga: New Moon” at $72.7 million, “The Twilight Saga: Eclipse” at $68.5 million, “The Dark Knight” at $67.2 million and “Transformers: Revenge of the Fallen” at $62 million. The Harry Potter series has taken in $5.5 billion worldwide in theatrical revenue since the first film debuted in 2001. I am a huge Harry Potter fan and cannot wait to see the movie. I wonder if Part 2 will do even better since it is suppose to be the end of the series. I am hoping .K. Rowling will change her mind. Have you seen the movie yet?